I read some of 1 Timothy 6 last night as part of my devotion and I think verse 11 is going to be my theme verse for life: “But thou, O man of God, flee these things; and follow after righteousness, godliness, faith, love, patience, meekness.” If we all did that, wouldn’t the world be a better place in which to live? What are “these things” from which we are to flee? Contentment…what does that mean? 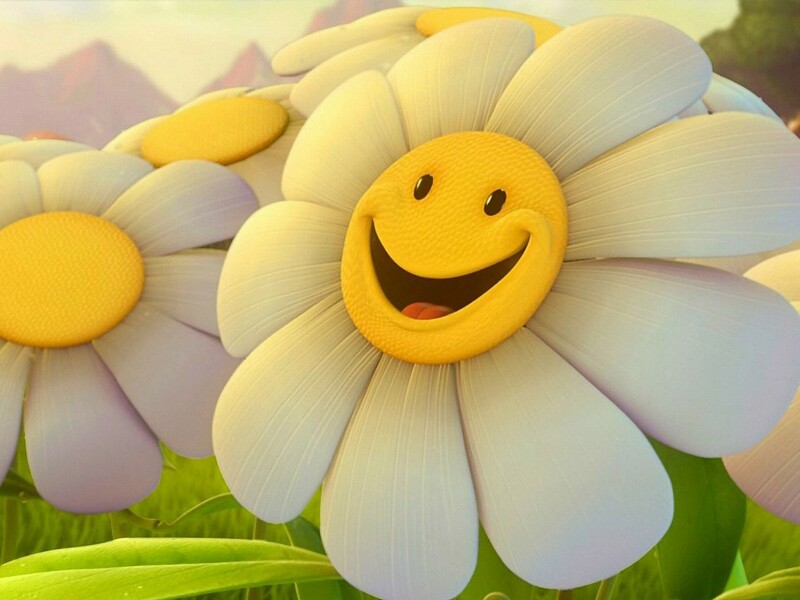 “A state of happiness and satisfaction”. I think so many of us are always seeking the next best thing, but we all need to learn to be “content” with what we have and the current situation. This week has been one of the best week’s of my life, but there’s been nothing monumentous about it. It’s been the joy in the little things like picking apples from the tree beside our house and watching the barn swallows fly around in the field. Also, my husband saying he played the best golf game of his life while describing his 25 foot putt in which he made par. And, I’m so darn proud of my son who is the most loving and well-behaved little thing I’ve ever seen in my life. So, my thought for the day is this: Be nice and be content. 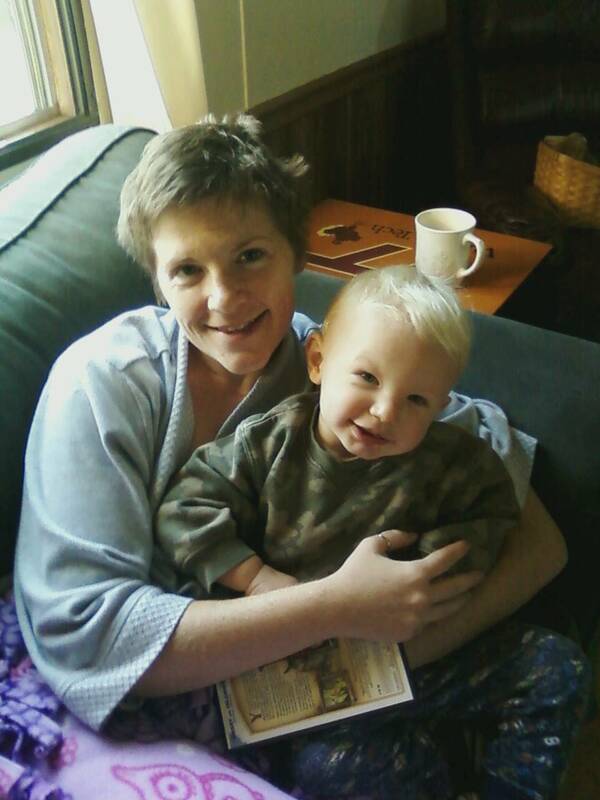 My son and I one Sunday morning before church. Gotta love my bed head! I’ve had two wonderful evenings in good ol’ Southwest Virginia. Well, they are all good, but these past two have been something wonderful and memorable. Yesterday, I took my son to help my dad pick wild fox grapes so dad can make his famous jelly. Dad really worried me climbing up so high on the ladder (that he had propped up on ANOTHER ladder), but he ended up safe and sound. I helped a little, but I was mostly chasing my 18 month old son around, making sure he didn’t fall off the little bridge into the stream. The setting was beautiful and thankfully I had taken my camera and got some good shots. Some local yocals had been putting up hay that day and it made me reminisce about when I had to put up hay in my teens. My dad way up high picking grapes. My little boy checking out the field. Dad was making me nervous on that ladder! Grandpa and grandson. I think I’ll get this one blown up and framed for dad. Beautiful red and purple flowers (not sure of their names). Ms. Spider doing a split. We had cows then and baled square bales. I was learning how to drive a manual transmission (what we call a “stick shift” or “straight” around here) and the truck was loaded down with hay bales. My loving father (he he) parked me on an incline and told me to drive up the hill. I was SO nervous. I popped the clutch and half the hay fell off the back. I cried because the boys my age saw the whole thing and I was so embarrassed. Oh, those teenage years. Speaking of growing up, I was thinking about kids today and what my son will grow up to be like. We had a group of 4th grade students come to the pool today for water safety and I watched them interact with each other. I just finished reading a book called “The Memory Keeper’s Daughter” and in the book, the mom tells the dad of the boy that she hopes he grows up to be happy. When it boils down to it, that’s all I want for my son. I want him to be happy as long as he’s being nice to others – people, animals, and the world in which he lives. I don’t have dreams of him being a doctor or the president. Anyway, I’m veering off subject! This evening, we had a bunch of barn swallows flying around in front of our house. We’ve lived here for about 8 years now and I’ve never seen them do that before. Here’s a glimpse of what we got to watch. Then, I took my son down to his grandparents on the 4-wheeler to spend the night (since my husband and I have to be gone so early in the morning). It was a beautiful ride down and we saw the big, orange sun setting as well as a deer running into the woods. On the way, I noticed the old apple tree was full of apples, so I stopped on the way back and picked some apples standing on the 4-wheeler. I just piled them up in my shirt and brought them home. My plan is to cook some up and freeze or can them for this winter. 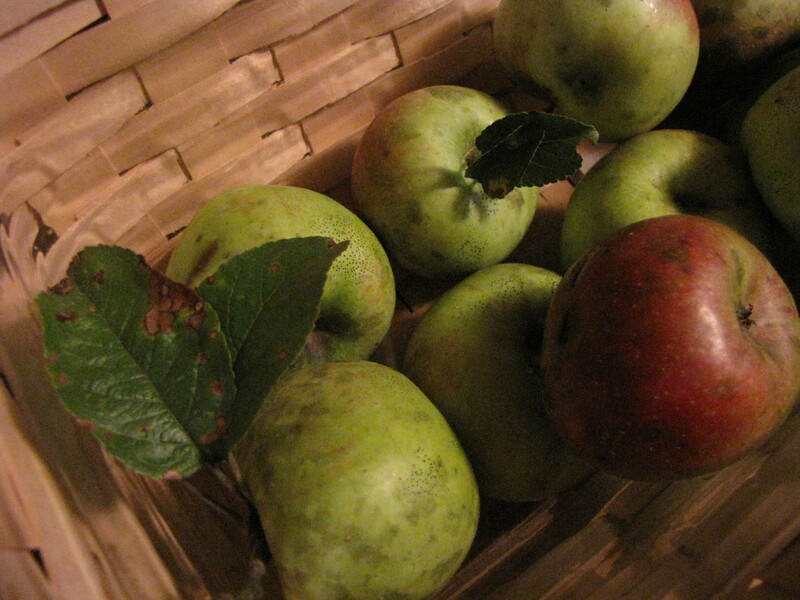 The best part is that they are “organic” – no pesticides on this ancient apple tree! Speaking of organic, I read a good article today in Prevention Magazine. It’s called “Is Organic Food Really Better for You?” – turns out, it is (but I already knew that). The more I read from all these different sources, the better I feel about the choices I’m making, but it also stresses me out because I’m not more organic than I am. There’s always room for improvement, I guess. I saw a sign for a local, organic produce place right down the road from my house. It’s only open on Saturdays, so I plan to check it out this weekend. One more thing and I’m done for the night… I’ve published over 100 posts on my blog! I think this is # 103 and I’m tickled. I can’t believe I’ve stuck with it this long. I love writing. Thanks for reading! I ran across this workout while putting together the “Workout of the Day” for the gym where I work. I tried it Friday and was sore through yesterday – big time on Saturday. I did it three times, not resting between each of the exercises, but I did rest about a minute between each round. I did regular push ups because I didn’t know what a “push up rotation” was…(now that I know, I will do it next time). By the time I got to round 3, my arms were so tired from the darn pushups, but it was well worth it! My husband said I said “I’m sore” over and over again on Saturday. 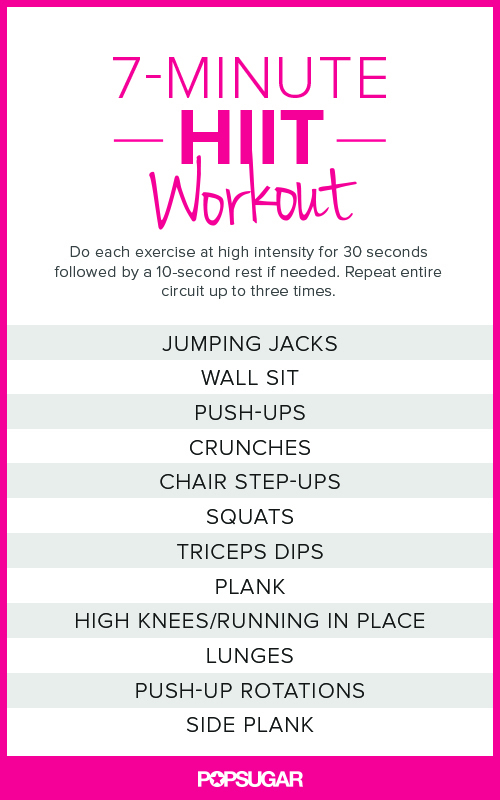 Try this workout – you’ll be happy you did! Nope, I didn’t win the lottery, but a friend gave me some home-grown, fresh produce from his garden and I was super excited about it! He brought me two bags of goods (which I shared with my mom) yesterday which included Swiss chard, collard greens, a HUGE zucchini, yellow squash, purple bell peppers, green peppers, basil (smelled heavenly), green beans, and tomatoes. After all my reading about local, organic food, I was ready to make yet another homemade meal. A sampling of the garden fresh produce a friend brought me yesterday. I got on allrecipes.com and typed in my ingredients, which led me to fix Ratatouille (something brand new for me). It was a delightful summer meal. I also made zucchini bread from a Farm Bureau cookbook recipe that I found. It turned out really well, too. Earlier this week, I made a spaghetti squash dish from a home grown squash my mother-in-law gave me. I was so tickled when my toddler son was gobbling up squash! I know I cooked another meal this week, but for the life of me, I cannot remember what it was! I remember making fried potatoes, corn on the cob, and macaroni and cheese on Monday, but I’m drawing a blank on what I cooked Tuesday night. I’ve just been on a roll this week cooking and really enjoying the fruits (and vegetables) of the season. I remember making those cobbler bars again (yummmm). OH! Now I remember what it was I made! I’m going to call it “Teresa’s Bake” because a friend gave this recipe to me. A lady used to make it for her and she loved it. I changed it up a bit, so I’m going to list what it calls for and what I used. Layer the following ingredients in a greased 2.5 quart baking dish, starting from the bottom. Bake in the covered dish for one hour at 350 degrees. It was a big hit with my family, too. I just made up a box of Jiffy corn bread (not the healthiest, but quick and easy) and there was dinner. Needless to say, I feel very domesticated this week. I’d rather spend my time cooking good meals for my family than sitting on my toosh watching the TV, but that’s just me. If I was working a full 40 hour week with a commute, I’d probably feel different about it, but thankfully my work week only consists of 30-35 hours with a 10 minute drive. Also, I’m not having to shuffle kids around to all kinds of sports practices, etc. BUT, when that time finally comes, I hope I still make it a priority to focus on feeding my family well. Even if the crock pot takes over in my absence! One more exciting thing! I emailed the local folks that I’m buying milk from and asked them if they might have a Jersey calf for sale and they said they might in about a month! I’m going to talk to my husband about it, but maybe we can get our Jersey girl soon. Yippee! Let me say, I love the book I’m reading (Animal, Vegetable, Miracle by Barbara Kingsolver). I told my husband the other day that I feel inspired and ashamed at the same time since I live in the mountains of beautiful southwest Virginia and have access to so much fresh farm food as well as the ability to grow so much of our own food. Needless to say, I’m starting with small changes that I hope will accumulate to big changes. Visiting the farmer’s market to buy fresh, local peaches, blackberries, and vine-ripened tomatoes. I made sure they were as local as possible and it made me feel so good to be part of something that’s helping “the little guys”. The farmer’s market is only about 5 minutes from the grocery store, but it seems like it’s always “too far” out to get to. I plan to make it my FIRST stop before going to the grocery store so I can stop up on better produce and help the local yocals. Cooking up a spaghetti squash that was given to me yesterday. My mother in law called saying a lady gave her some spaghetti squash. Having never cooked one myself, I got online and found a lasagna like recipe that I whipped up for dinner. It was a hit with all family members, including the carnivore husband AND 18 month old sometimes picky eater. Digging my own taters! I saved that one for last because it’s been years since I did that and I felt a sense of accomplishment after that. My father in law and husband planted a big plot of potatoes this spring and there are nice potatoes in the dirt underneath (side note: in the book, she talks about how some people don’t know there is a part of potato that grows ABOVE ground…are you one of those people?) Granted, I only dug up 5 or 6 because I was wearing shorts and a t shirt and fighting those darn briers is a losing battle. I know those are high hopes, but I truly think I can fulfill them. My son is getting older every day, and I plan to involve him and my husband in my farming efforts. My husband is sweet and agrees when I tell him about my plans. I know in the back of his mind, he’s wondering if I can hack the manual labor that comes with all those responsibilities, but I plan to make it a family affair; however, I won’t be delegating all the work to the boys. Sometimes, I find myself wasting so much time laying around that it’s pathetic. I value rest, but I don’t value laziness, ya know? Anyhoo, if you’ve not read the book, I highly recommend it. There’s also a blog, but I’ve not had time to check it out yet. I plan to do that very soon. I had a lady tell me a bit ago that she wished she could be as happy as I am. I admit, I am one of those annoyingly happy people. There’s a man that comes into my place of work and shakes his head saying, “There’s no way you can be THAT happy all the time.” Well, most of the time, I am. Are there days when I’m not happy? Yep. Do I stay that way for long? Nope. I was telling the lady this morning that it’s my CHOICE to be happy. When bad things come along, you can either let them get you down, or “keep on the sunny side” and realized how blessed you are and how much better you have it than most folks. Most of us are always better off than someone in this world. I read a statistic the other day that 75% of the world lives on less than $10 per day. That’s right at $300 per month (or less). That means I’m in the wealthy 25% of the world, even though I’m not wealthy by most American standards. But, I really feel rich. I have good health, a loving family, a good job, nice friends, and a promise of a better tomorrow. John 14:2 says ” In my Father’s house are many mansions: if it were not so, I would have told you. I go to prepare a place for you.” That’s one reason I’m so happy…this life is temporary. I love my life and I love this earth, even though it is evil and bad sometimes. However, I am really looking forward to stepping into an unimaginable fantasy world when my life is over. When things seem difficult or bad, all I have to do is remind myself that one day, I will never cry again. I will never experience sorrow, discouragement, anger, or any negative feeling. Here are some lyrics to some songs we sing in church that I sing to myself a lot to remind me of what’s coming one day. “Oh no I’m not afraid to cross that river. My Father owns the land on both sides. He’ll walk with me through the shadows. I gave the lady an example of when my car messed up a few weeks back. All the transmission fluid leaked out, but thankfully I realized it before driving it and locking up the transmission. Some people would moan and groan about that, but I looked at this way – at least I was at home when I had it towed. At least I didn’t destroy my transmission. God was looking out for me. Make a choice today to be happy. It’s a whole lot better than choosing to be sad or mad. My exact words when I saw this banner ad on Pandora were “Are you serious?” I’m simply amazed at the crap they will put on TV. Like, the Hatfields and McCoys reality show. Puhlease!